September is one of the best months of the year, and not just because it’s my birthday month. 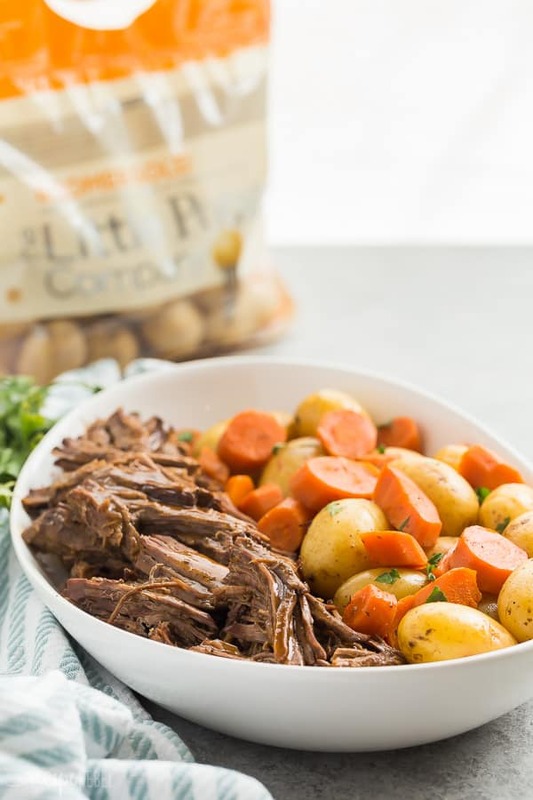 It means that things like this Instant Pot Pot Roast are back on the table. If you look around my site for about 5 seconds, you know that healthier comfort food is my jam. Sure, there’s the occasional over the top dessert (it’s all about balance, right?? ), but you won’t see a lot of green salads or smoothie bowls. It’s not because there’s anything wrong with those things, I just really believe in nourishing our bodies with real food, full flavors, and enjoying every bite. 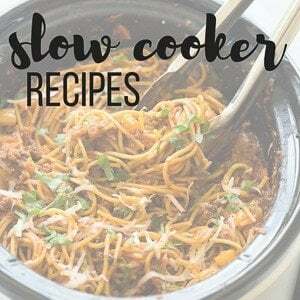 I haven’t always been sold on the Instant Pot or electric pressure cooker (I use the Instant Pot brand, but other brands of pressure cookers will work just as well), but at the beginning of the year I set out to really give it a chance and see what all the hype was about. I discovered that I actually liked it (surprise!) for certain things, but that it wasn’t going to replace my slow cooker, stove top or oven. 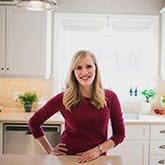 My favorite things to cook in the Instant Pot? 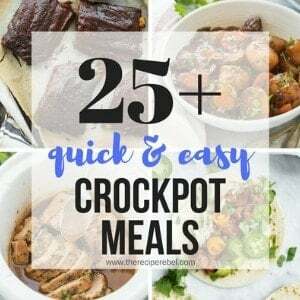 The recipes that also usually do well in the crock pot, but in the Instant Pot they take just a fraction of the time. Large, tough cuts of meat, roasts, soups with lots of veggies (like this Chicken Noodle Soup! ), and macaroni when you need it to cook in two minutes. 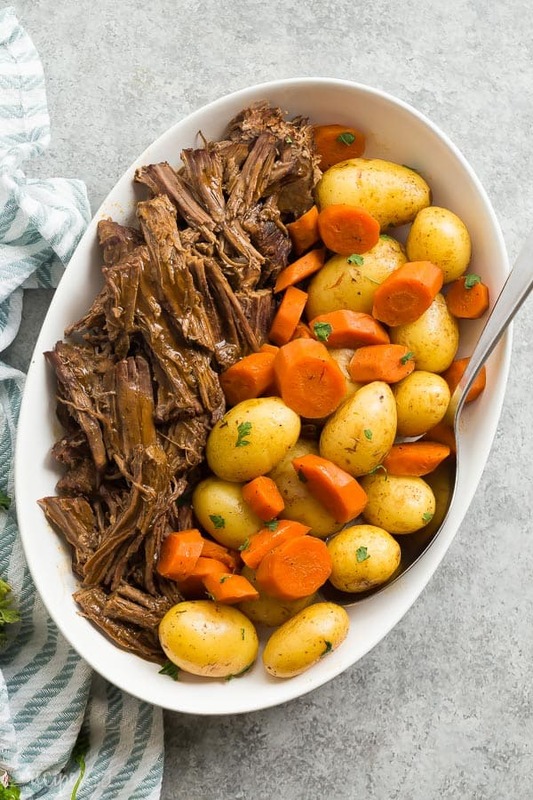 This Instant Pot Pot Roast is so tender it falls apart when you try to take it out. It has such great flavor, that you can even skip the searing if you want (I’ll be honest, I am often to lazy to sear my meat first!). One thing it is missing? Mushy vegetables. Vegetables in the Instant Pot cook very quickly, often just a few minutes or less. I wanted to really show off the smooth, creaminess of these Little Potatoes and how quickly they can cook in the pressure cooker. For this reason, I opted to add my vegetables near the end of the cook time. I know that this is an extra step and you might be wondering if it’s worth it. If you know me, you know I’m not into any extra unnecessary steps (or dishes, or ingredients!). But Little Potatoes cook under pressure in just a few minutes, and you really don’t want them under high pressure for 60 minutes or more. You can throw them in whole with no washing or peeling (see! We’re saving steps 😉 ), so it’s not going to inconvenience you too much to add them part way through. 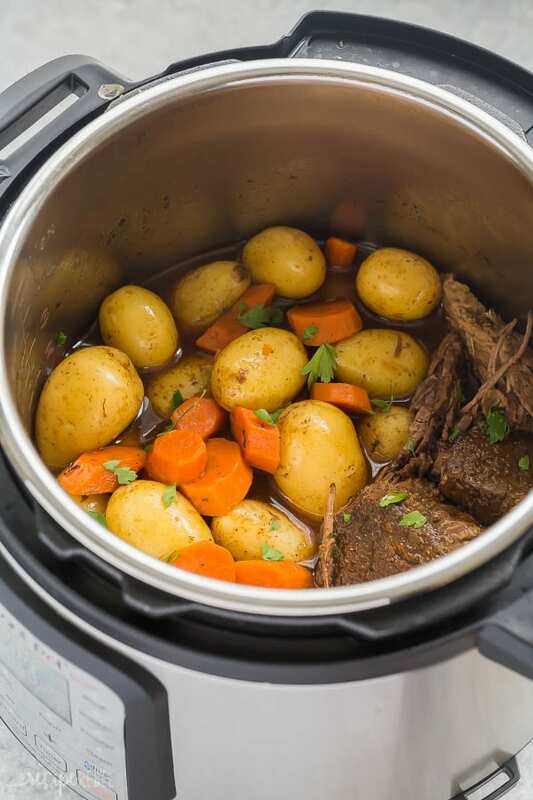 You don’t have to spend big money on a great cut of meat to make a pot roast — the Instant Pot tenderizes an inexpensive roast in an hour or less! This is one time where you can save a little and still have an amazing meal. If you are using a leaner cut of meat, I recommend cutting into smaller pieces so it is more tender. Like I mentioned before, please do not add the veggies for the first cook time. You do not want your veggies cooking an extra 60+ minutes under high pressure! 3 minutes and they are perfectly tender and fluffy. You can skip searing the meat if you need to cut out some prep time, but it does add significant flavor to the dish overall. If you don’t sear, you’ll find that your juices (and therefore gravy if you thicken it) will be more “beefy” and you will taste less of the other flavors. If you need to save some time, cut the roast into 2-3″ chunks and pressure cook for 40-50 minutes, or save even more time by using pre-cut stewing beef. All of my Instant Pot recipes are tested in a 6 quart Instant Pot — I know the 8 quarts and different models have different liquid requirements so it’s important to take that into consideration. *This post is generously sponsored by The Little Potato Company and I was compensated for my time in creating it — all opinions are, as always, my own. *Please note that while the cook time is only 58-68 minutes, the total time including the time it takes to build pressure and natural pressure release is roughly 1 hour 40 minutes to 1 hour 50 minutes. ** All of my recipes are tested in a Smart Bluetooth 6 quart Instant Pot -- please take into consideration your model and its requirements before making the recipe. ***I know that some have found their meat is not tender after 55-65 minutes and have had to add more time. This will vary depending on your model of pressure cooker, the size and type of your roast, if you sear the meat first, how you like your meat cooked, among other things. My roast is fork-tender at 55 minutes, but you may cook yours up to 90 minutes depending on the things listed above. Omg ! The recipe was amazing … the best roast I’ve ever had or made. Turned out perfect ! Thank you for sharing it. Thanks Nitul! I’m so glad! So how is the total time in this 1 hour and 13 minutes? By my quick math the active cooking time starting at the searing part and ending at the second 10 minute steam release is nearly an hour and a half. The total time listed at the top of the recipe only includes the prep and cook time (it’s calculated automatically), and not the time to build pressure or release. Thank you so much Juli! That makes me so glad! Thanks Katharine! I’m so happy to hear it went over well! Thanks for sharing.. the only thing that I changed was adding some crushed garlic and a whole onion sliced as well as increased the cook time extra 10 minutes. Great recipe! Thanks Lindsay! I’m glad you liked it! I made this tonight. It was my first time ever making a pot roast so I followed your recipe exactly and it turned out perfectly. So delicious! Thank you for sharing this recipe. Thanks Melanie! I’m so happy you enjoyed it! This is my 3rd time making this roast! Turns out delicious everytime!! So simple to make. I have an 8gt Pressure Cooker. I add extra carrots & potatoes. 60 minutes & meat is super tender!! One of my favorites! Thank you for this delicious recipe!! Thanks Darci! I’m ecstatic to hear that! I have tried to make fork-tender roasts for years in the oven, with various cuts of meat, cook times, etc. They always turned out tough. 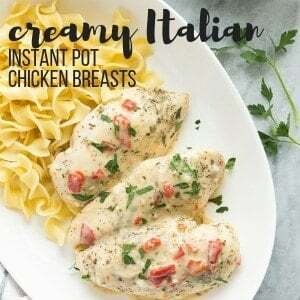 But I just got my Instant Pot and tried this recipe. Turned out amazing ! It was exactly what I needed to cook a perfectly tender roast. I seared the meat, and added the veggies for the last 10 minutes of cook time and wallah, perfect. Not mushy and full of flavor. This is a keeper ! Thanks Stacy! It’s my favorite way to do roasts now! Made it tonight for my husband. He said it was better than his mom’s. Well that is an awesome compliment! I’m so glad you liked it! This turned out great! I had to make a few adjustments tho. I didn’t have Canola oil, so I used vegetable oil instead and it worked fine. I didn’t have tomato paste, so I omitted that item. I didn’t have balsamic vinegar and used apple cider vinegar instead. I also added 1 teaspoon of sage and i used chicken broth instead of beef broth. I also, put the vegetables in the pot and added the pot roast o top of them to cook. Delicious! Thanks Sandy! I’m glad you liked it! Omg this is the first time a roast I made came out so tender and tasty!!! Yay!! I will be making this all the time !! That makes me so happy Jennifer! I’m so glad! Used this recipe and it turned out great. I had to used apple cider vinegar due to being out of balsamic. Also used fresh garlic. I used apple vinegar as well! Came out delish!!! I’m assuming that you start with a thawed pot roast? How much longer would you recommend for a frozen roast? Question…..high or low pressure setting? So I made this today and it turned out great! I did sub out the Worcestershire and balsamic for a can of cream of mushroom and I only seared it minimally (maybe 45-60 sec on 3 sides or so since the meat had several different sides the way it was cut). But boy did it turn out awesome! This saved me in a bind because I ran out of time to slow cook it for 8 hours and was able to have it ready by 6! Thanks so much for the recipe/directions!!!! I love that! Thanks so much for coming back to leave a comment! We tried this for the first time tonight and honestly I think this is the BEST tasting roast I have ever had!! I will totally be making this again! Oh, and on of that it was so easy to make! Thanks for sharing this wonderful recipe with us!! Thanks Tiffanie! I’m so happy to hear that!